With my restoration coming along, it's time to address the passenger compartment. Before carpet, seats and cupholders can be installed, the floor needs a layer of sound deadener. But before the sound deadener can go in I have to get everything out of the car. 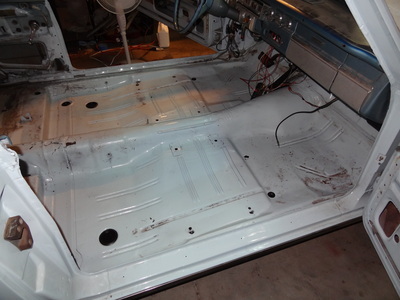 With the seat frames and everything else out of the car, the floor is looking pretty dirty. So time to hit it with a shop-vac. With all the loose dirt and particulate gone, the floor looks better but is still quite dirty. The instructions for my sound deadener state that I need to use a wax and grease remover on the surface prior to laying down the material. So I broke out our bottle of Marine Clean. This is potent stuff and must be diluted. 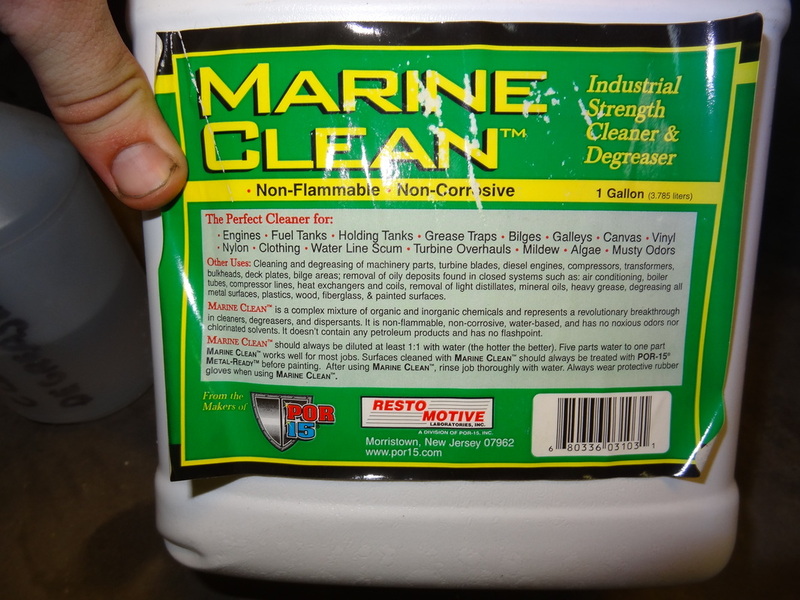 I opted for a 5 parts warm water to 1 part Marine Clean as per the label on the bottle. 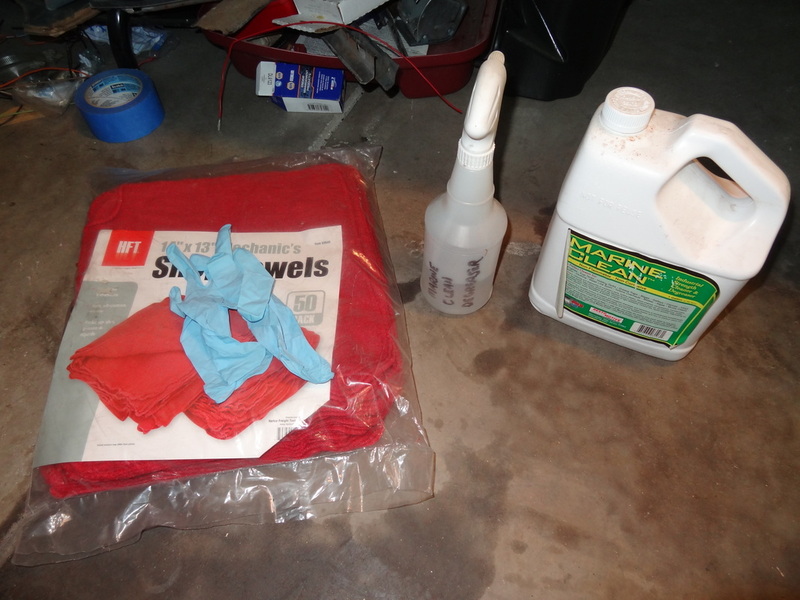 Blue Nitrile gloves and a fresh bag of shop towels and I'm ready to get to work. Additionally, Marine Clean vapors are nasty to breathe, so I opened both doors on the car and setup a fan to blow through the car, that cleared out the fumes well enough to work in the car. Several shop towels later and a final rinse with water (again, as per the label instructions) and the floor looks a bit cleaner and should be free of grease. With a clean working surface, I started to lay down my sound deadener. I opted for B-Quiet Ultimate sound deader from B-Quiet.com as it is cheaper than Dynamat and should be very close in sound deadener performance. I bought a 50-sqft roll and cut it into 1 foot square sections to make it easier to work with. I found that while I was moving around the inside of the car working with the material, the black sticky backing material was working its way up through the seams between panels. 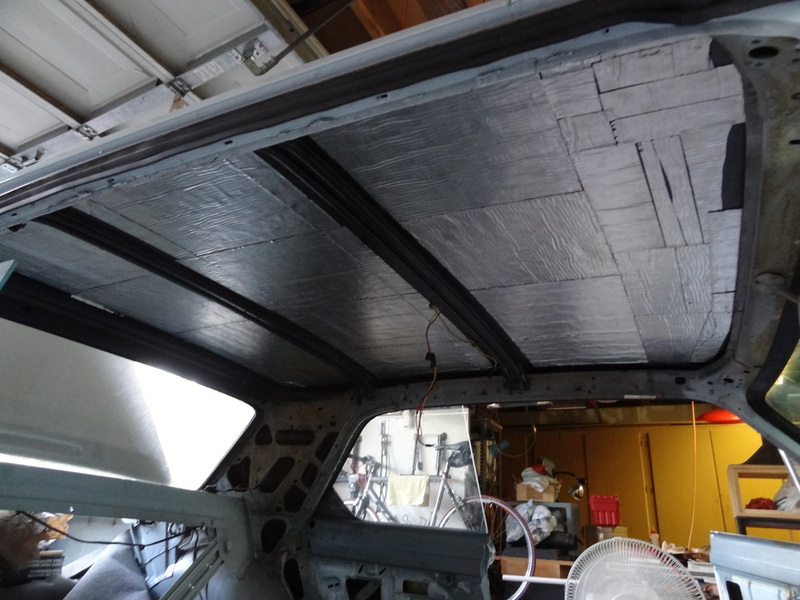 In order to prevent smearing the black adhesive all over the car and myself while I worked, I grabbed our roll of aluminum ducting tape and taped over all the cracks and seams of sections I had already installed. 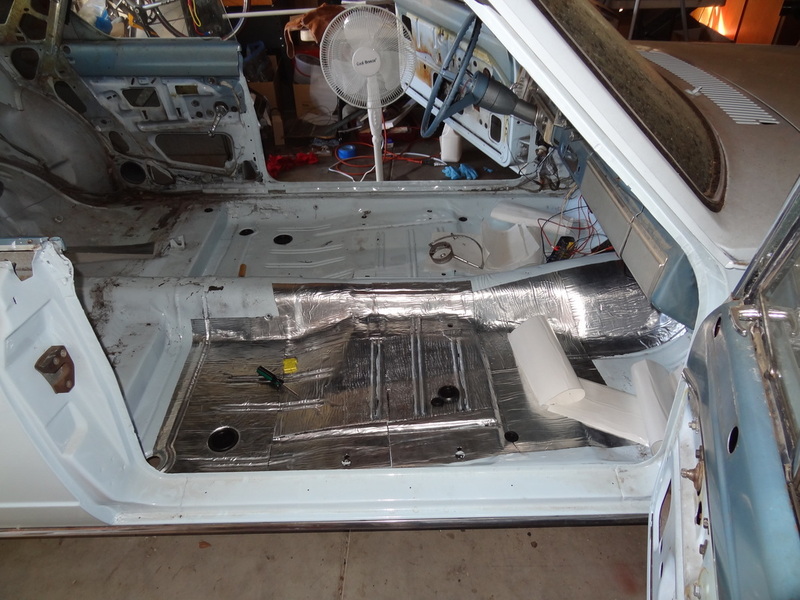 It took several hours to finish covering the floor pan with the sound deadener and I learned a couple things in the process. First and foremost, start at a relatively square and flat corner and work from there. 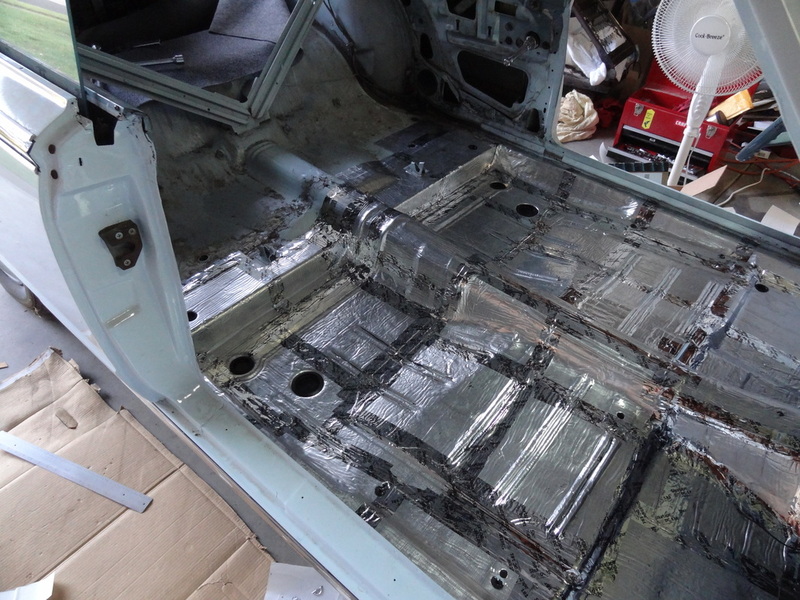 I started on the passenger side of the car up where the the transmission hump meets the firewall. This was a curved surface and screwed up most of the panel fitment from then on. 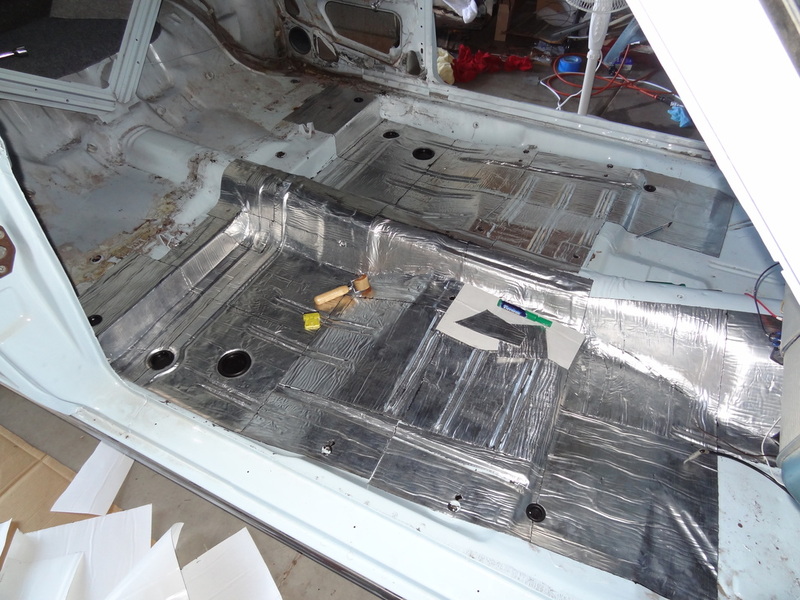 I took that lesson and when I started on the driver's side, I choose the flattest, most square corner of the floor pan I could find. This ended up being the far corner, behind where the driver's seat would go near the door jam. 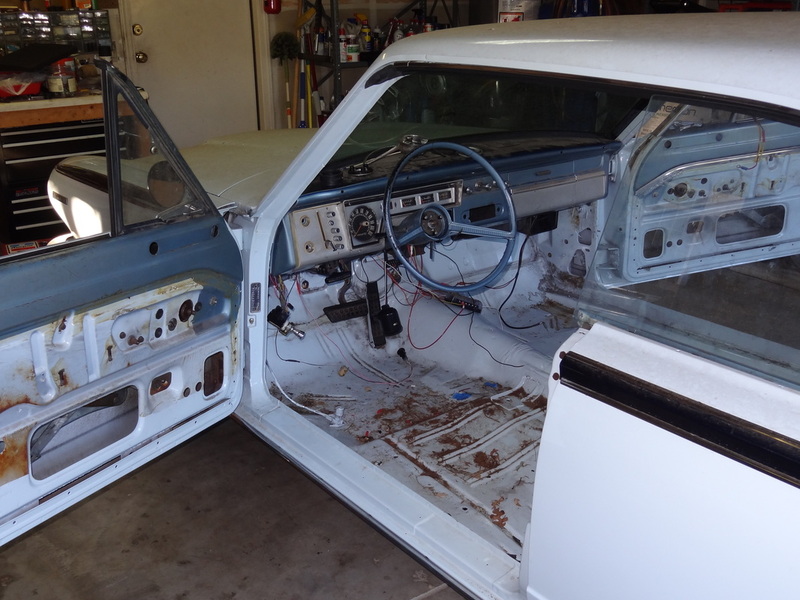 From there I worked forwards toward the firewall and inwards towards the transmission hump. This worked much better and required fewer panels to be specially cut and fitted. I double checked that the sound deadener was doing its job by knocking on various sections with my knuckles. 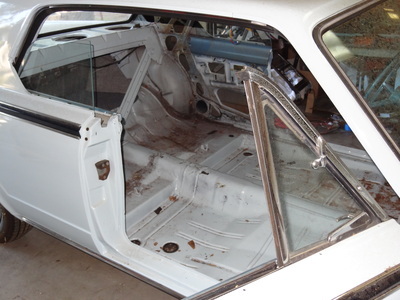 Up near the firewall and along the floor to where the front seats mount sounded good. 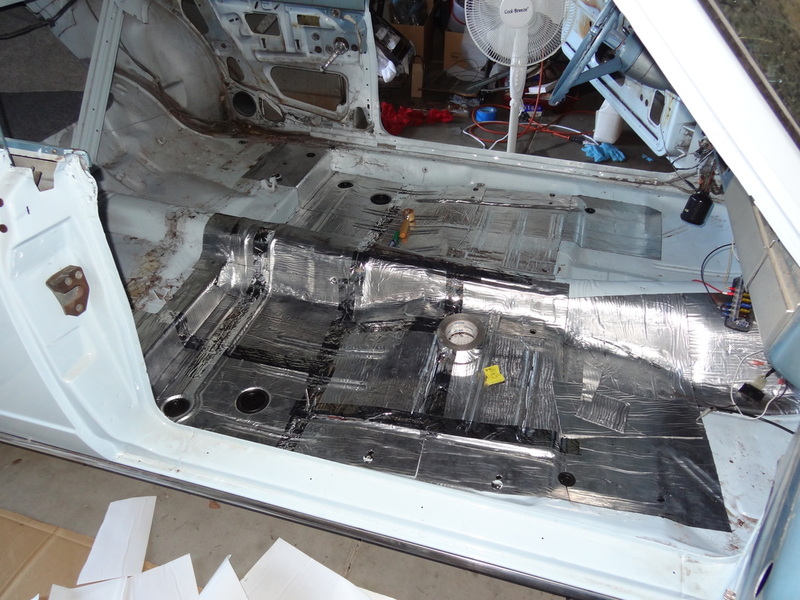 The rear passenger foot-well area still sounded like it needed some work, so I added an additional 12"x12" section to each side of the rear passenger foot-well and that deadened it nicely. 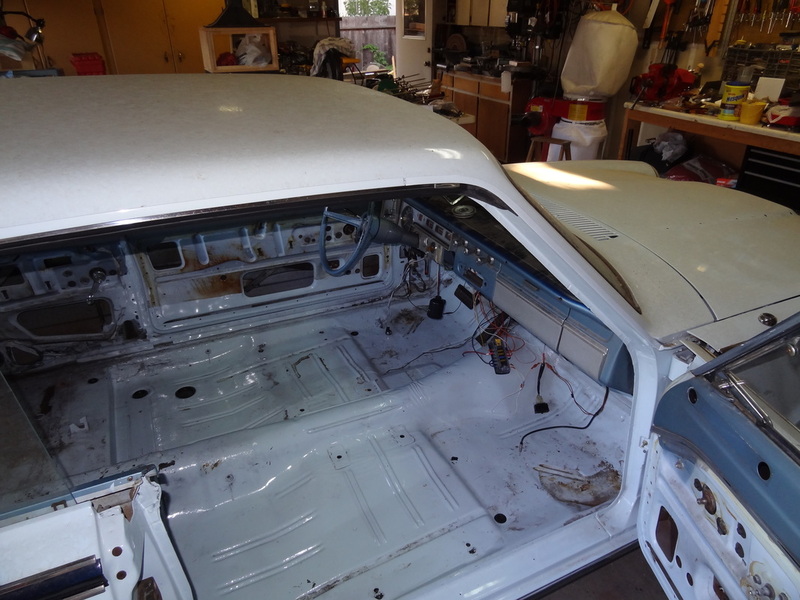 I didn't go all the way up towards the trunk as that already sounded fine with my scientific test and that whole area would also gain the benefit of the rear bench seat once that gets installed. 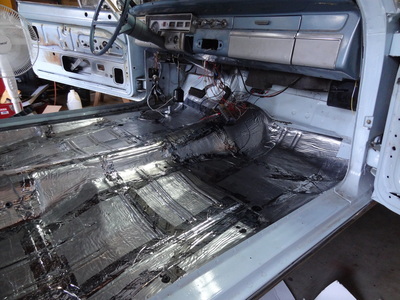 I had about a dozen 12"x12" panels of sound deadener left over and I didn't want it to go to waste, so I looked around inside the passenger compartment for ideas of where I could use this stuff. Looking up, I noticed the roof (where it should be) and gave it a couple quick raps with my knuckles. It sounded horrible. So I got to work. About an hour later I was completely out of sound deadener and I had just barely covered the entire roof in-between the cross-ribs. This helped quiet down the roof considerably and put to use all the remaining panels as well as all my cut scraps.